RIO DE JANEIRO — The president of Brazilian state oil company Petrobras resigned June 1, the latest fallout from a crippling truckers’ strike over fuel prices that has widespread implications for the future of Latin America’s largest economy. The dayslong strike led to shortages of supplies ranging from food to medicine, shuttered thousands of public schools and grounded numerous airline flights. It ended earlier when President Michel Temer announced plans to subsidize a 10% drop in the price of diesel for 60 days. While many speculated that Petrobras CEO Pedro Parente could end up resigning, the government also had much hope that he would not. “This shows the weakness of Temer’s government and its inability to maintain the combination of reforms it had put in place,” said Andre Perfeito, chief economist at Spinelli CVMC, an investment company in Sao Paulo. Temer and several ministers had gone to great lengths to argue that bucking to truckers’ demands would not interfere with Petrobras’ ability to set prices, a key part of the company’s rebuilding plan after a massive corruption scandal. They also said Parente, widely respected in financial and government circles in Brazil and beyond, would remain in place. The markets, however, were not convinced about the future. Petrobras’ stock price dropped sharply in the last two weeks, reversing large gains made in recent years. On June 1, Petrobras’ stock prices tumbled further, closing 17% lower from the previous trading day in Brazil. In his resignation letter, Parente said the strike had set off an intense debate over Petrobras’ pricing policies but little reflection about the realities of world fuel prices. “My remaining as president of Petrobras would not contribute positively to the alternatives the government must come up with going forward,” he wrote. The development raises questions about the future of one of Brazil’s most important companies. Ultimately, truckers and many other sectors in Latin America’s largest nation want a permanent return to the recent past, when the government and Petrobras would set fuel prices that were heavily subsidized. However, that stands in stark contrast to Petrobras’ approach since Temer took over from President Dilma Rousseff when she was impeached and removed from office in 2016. As part of a series of reforms aimed at pulling Brazil from a deep recession, Temer’s administration said there would no longer be interference in Petrobras pricing. Parente, who had served in key Cabinet positions in previous governments, was brought in. The rebuilding process was also important in the wake of the Carwash investigation. Launched in 2014, investigators uncovered a massive graft scheme in which construction companies, with contracts from Petrobras, paid billions of dollars in kickbacks to politicians and other public officials. The investigation continues to this day, and has led to the jailing of many of the country’s elite, including former President Luiz Inacio Lula da Silva and former Petrobras directors. As a result of the recent reorganization, Petrobras had regained investors’ confidence before truckers began striking May 21. The combination of rising world oil prices and a sharp devaluation of the Brazilian real against the U.S. dollar has caused fuel prices to jump since last year, which had an acute impact on truckers. The company’s future is particularly important as October presidential elections loom ahead. 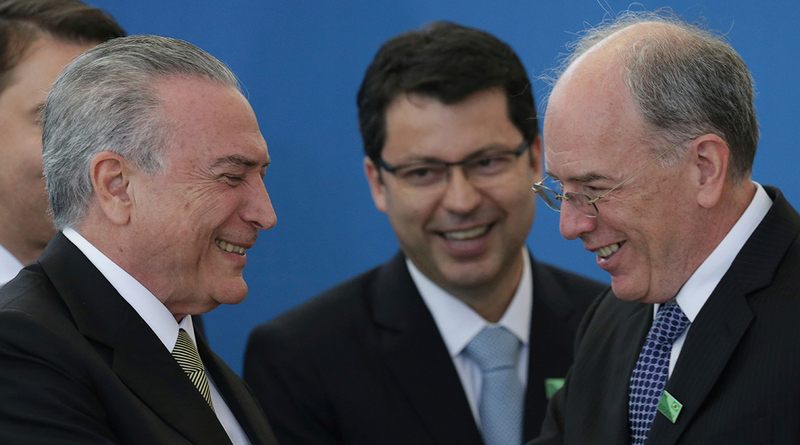 In recent days, most of the top candidates have expressed interest in a stronger government hand in Petrobras. Also on June 1, Petrobras said Ivan de Souza Monteiro, an executive in the area of finance and investor relations, would take over on an interim basis.